Early settler S. S. Rogers built the first house in what would become Liberal in 1872. Rogers became famous in the region for giving free water to thirsty travelers. Reportedly, Liberal gained its name from the common response to his acts of kindness, "That's very liberal of you." In 1885 Rogers built a general store, and with it came an official U.S. Post Office. Rogers named the post office 'Liberal'. After the railroad was built close by, a plan for the town site was created in 1888. A year later the population was around 800. Drought caused some farmers to give up and look for more fertile territory; however, when the nearby Indian Territory was opened, more settlers headed to the cheap land that would become Oklahoma. Natural gas was discovered west of town, in what would become part of the massive Panhandle-Hugoton Gas Field, in 1920. Oil was discovered southwest of town in 1951. In 1963 the largest helium plant in the world, National Helium, was opened. Liberal is located at 37°2′36″N 100°55′41″W﻿ / ﻿37.04333°N 100.92806°W﻿ / 37.04333; -100.92806 (37.043418, −100.928133) at an elevation of 2,835 feet (864 m). Located in southwestern Kansas at the intersection of U.S. Route 83 and U.S. Route 54, Liberal is 140 miles (225 km) north-northeast of Amarillo, Texas, 202 mi (325 km) west-southwest of Wichita, and 288 mi (463 km) southeast of Denver, Colorado. The city lies approximately 10 miles (16 km) southwest of the Cimarron River in the High Plains region of the Great Plains. According to the United States Census Bureau, the city has a total area of 11.75 square miles (30.43 km2), of which 11.61 square miles (30.07 km2) is land and 0.14 square miles (0.36 km2) is water. Liberal has a semi-arid steppe climate (Köppen BSk) characterized by hot, dry summers, cool, dry winters, and large diurnal temperature variation year-round; relative humidity averages 63%. On average, January is the coldest month, July is the hottest month, and June is the wettest month. The monthly daily average temperature ranges from 34.1 °F (1.2 °C) in January to 79.3 °F (26.3 °C) in July. The high temperature reaches or exceeds 90 °F (32 °C) an average of 80 days a year and 100 °F (38 °C) an average of 18 days. The minimum temperature falls to or below 0 °F (−17.8 °C) on an average 5.3 days a year. The highest temperature recorded in Liberal was 114 °F (45.6 °C) as recently as June 10, 1981; the coldest temperature recorded was −19 °F (−28.3 °C) on January 7, 1912. On average, Liberal receives 20.15 inches (512 mm) of precipitation annually, a majority of which occurs from May to August, and records 58 days of measurable precipitation. Measurable snowfall occurs an average of 8.9 days per year with 6.1 days receiving at least 1.0 inch (2.5 cm). Snow depth of at least one inch occurs an average of 9.5 days a year. Typically, the average window for freezing temperatures is October 21 through April 14, and that for temperatures below 0 °F or −17.8 °C from January 5 to January 24. Liberal is located in USDA Plant Hardiness Zone 7. As of the 2010 census, there were 20,525 people, 6,623 households, and 4,838 families residing in the city. The population density was 1,832.6 people per square mile (707.6/km²). There were 7,118 housing units at an average density of 641.3 per square mile (248.9/km²). The racial makeup of the city was 68.6% White, 3.7% African American, 2.9% Asian, 0.8% American Indian, 0.2% Pacific Islander, 20.6% from other races, and 3.2% from two or more races. Hispanics and Latinos of any race made up 58.7% of the population. There were 6,623 households of which 42.3% had children under the age of 18 living with them, 52.7% were married couples living together, 7.1% had a male householder with no wife present, 13.2% had a female householder with no husband present, and 27.0% were non-families. 21.7% of all households were made up of individuals, and 7.5% had someone living alone who was 65 years of age or older. The average household size was 3.03, and the average family size was 3.54. The median age was 28.4 years. 32.1% of residents were under the age of 18; 12.4% were between the ages of 18 and 24; 27.8% were from 25 to 44; 19.4% were from 45 to 64; and 8.3% were 65 years of age or older. The gender makeup of the city population was 51.4% male and 48.6% female. The median income for a household in the city was $40,247, and the median income for a family was $44,167. Males had a median income of $31,435 versus $25,208 for females. The per capita income for the city was $17,668. About 15.3% of families and 17.8% of the population were below the poverty line, including 23.6% of those under age 18 and 8.2% of those age 65 or over. As of the census of 2000, there were 19,666 people, 6,498 households, and 4,756 families residing in the city. The population density was 1,778.4 people per square mile (686.5/km²). There were 7,014 housing units at an average density of 634.3 per square mile (244.9/km²). The racial makeup of the city was 63.56% White, 4.21% African American, 0.72% Native American, 3.25% Asian, 0.06% Pacific Islander, 23.93% from other races, and 3.27% from two or more races. 43.30% of the population were Hispanic or Latino of any race. There were 6,498 households out of which 42.8% had children under the age of 18 living with them, 58.0% were married couples living together, 10.4% had a female householder with no husband present, and 26.8% were non-families. 21.3% of all households were made up of individuals and 8.1% had someone living alone who was 65 years of age or older. The average household size was 2.96 and the average family size was 3.46. In the city, the population was spread out with 31.7% under the age of 18, 12.1% from 18 to 24, 30.5% from 25 to 44, 16.7% from 45 to 64, and 9.1% who were 65 years of age or older. The median age was 29 years. For every 100 females, there were 104.6 males. For every 100 females age 18 and over, there were 103.3 males. The median income for a household in the city was $36,482, and the median income for a family was $41,134. Males had a median income of $29,315 versus $22,017 for females. The per capita income for the city was $15,108. About 14.3% of families and 17.7% of the population were below the poverty line, including 21.8% of those under age 18 and 7.6% of those age 65 or over. Energy and agriculture are the main economic drivers of the area. Natural resources include oil, natural gas, water, gravel and sand. The beef industry (ranches, feed lots and packing plants) is Liberal's largest source of employment. Hard winter wheat, corn, milo, alfalfa and cotton are common crops. Trucking is a major industry. Dairies and pork processors are a growing business. As of 2012[update], 70.2% of the population over the age of 16 was in the labor force. 0.0% was in the armed forces, and 70.2% was in the civilian labor force with 63.4% being employed and 6.9% unemployed. The composition, by occupation, of the employed civilian labor force was: 28.5% in production, transportation, and material moving; 20.0% in natural resources, construction, and maintenance; 19.9% in sales and office occupations; 18.9% in management, business, science, and arts; and 12.6% in service occupations. The three industries employing the largest percentages of the working civilian labor force were: manufacturing (24.4%); educational services, health care, and social assistance (19.4%); and retail trade (10.5%). The cost of living in Liberal is relatively low; compared to a U.S. average of 100, the cost of living index for the city is 80.8. As of 2012[update], the median home value in the city was $85,600, the median selected monthly owner cost was $961 for housing units with a mortgage and $383 for those without, and the median gross rent was $648. Liberal has a commission-manager government with a city commission consisting of five members elected at-large. Elections occur every two years in the odd numbered year, and commissioners serve two-year or four-year terms depending on the number of votes they receive. Each year, the commission appoints a member to serve as mayor and another to serve as vice-mayor. The city manager heads the city administration. There is also a Christian school in Liberal: Fellowship Baptist School (K-12). U.S. Route 83 runs north-south along the east side of the city, intersecting U.S. Route 54 which runs northeast-southwest. In addition, Liberal is the western terminus of U.S. Route 270 which runs concurrently with U.S. 83 south from the city. Liberal Mid-America Regional Airport is immediately west of the city. Publicly owned, it has two operative paved runways and is used primarily for general aviation. United Express provides airline service with daily flights to Denver. The Tucumcari Line of the Union Pacific Railroad runs parallel to U.S. 54 northeast-southwest through the city. Four newspapers are published in Liberal. The Leader & Times is the city's main daily newspaper, published six days a week. It is the result of the merger between the city's two previous dailies, the High Plains Daily Leader and the Southwest Daily Times. The publisher of the Leader & Times also prints a weekly Spanish language paper, El Lider. Seward County Community College publishes a bi-weekly student newspaper, the Crusader. The fourth paper is the Liberal Light, published weekly. Liberal is a center of broadcast media for southwest Kansas and the Oklahoma Panhandle. Two AM and seven FM radio stations are licensed to and broadcast from the city. Liberal is in the Wichita-Hutchinson, Kansas television market, and one television station broadcasts from the city: KSWE-LD, a sister station of KDGL-LD in Sublette, Kansas. On cable, viewers can receive stations from the Wichita/Hutchinson market (via semi-satellite stations in Garden City/Ensign), PBS' Tulsa affiliate, KOED, as well as Amarillo, Texas's CBS affiliate, KFDA-TV. Liberal is famous for its annual Pancake Day race that is held in competition with the town of Olney, United Kingdom for the fastest time between both cities. Liberal's Adventure Bay water park in 2010. Liberal has a water park known as Adventure Bay. The fifth largest collection of civilian and military aircraft in the United States is located at the Mid-America Air Museum. Started with a gift of fifty planes by General Tom (Thomas) Welch, Jr., the museum has more than one hundred aircraft. The Coronado Museum has items from the Native Americans that lived in the area, as well as items from Francisco Vásquez de Coronado's expedition to the area in 1541, and the history of farming and ranching in the county in more recent times. Liberal is home to "The Land of Oz" exhibit from The Wizard of Oz, a recreation of Dorothy Gale's house and the famed Yellow Brick Road, featuring donated bricks bearing the names of such luminaries as former U.S. Senator Bob Dole, Ronald and Nancy Reagan, and Liza Minnelli (Judy Garland's daughter). This exhibit was originally designed and displayed for Topeka in 1981, but relocated here eleven years later by its creator Linda Windler. Liberal Memorial Library is located on North Kansas Avenue between Fifth and Sixth Streets in Cooper Park. The Book Front entrance was completed in April 1955 and designed by the building's architect George L. Pitcher. Wheeler Williams, a sculptor from New York, signed an agreement in October 1960 to mold the "Pioneer Mother of Kansas." This six foot statue, sponsored by Mr. and Mrs. D. K. Baty, was to be erected in Cooper Park on Memorial Day, May 30, 1961. It was placed opposite of the "Statue of Liberty," which was donated and placed in Cooper Park by the Boy Scouts of America. The Liberal Bee Jays, a semi-professional baseball team, have won five national championships and 13 state championships. The Bee Jays have been coached by three major league managers and have sent 165 players to the major leagues. Composer Mark So wrote his LIBERAL PLAIN SONG (for Joseph Kudirka) while stopped at a gas station in Liberal in 2005. In the film National Lampoon's Vacation, Clark W. Griswold mentions departing the route of travel to Liberal to see the world's largest house of mud. The idea is rejected by his wife, Ellen, in favor of getting to her cousin Eddie's home. ^ a b "American FactFinder". United States Census Bureau. ^ a b c d e f g "American FactFinder 2". United States Census Bureau. Retrieved 2011-08-30. ^ Pressler, Jessica (12 December 2017). "A Militia's Plot to Bomb Somali Refugees in a Kansas Town". New York Magazine. Retrieved 2017-12-29. ^ a b c "2003-2004 Official Transportation Map" (PDF). Kansas Department of Transportation. 2003. Retrieved 2011-06-02. ^ a b "Historical Weather for Liberal, Kansas, United States of America". Weatherbase. Retrieved 2010-02-28. ^ "Average weather for Liberal, KS". The Weather Channel. Retrieved 2014-01-14. ^ a b c d "NOWData - NOAA Online Weather Data". National Weather Service Forecast Office - Dodge City, KS. Retrieved 2010-06-05. 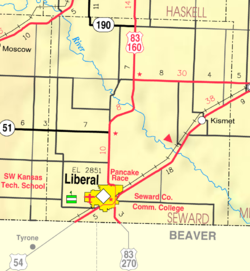 ^ "Liberal, Kansas". City-Data.com. Retrieved 2014-01-14. ^ Labor Market; City of Liberal. ^ "City Commissioners". City of Liberal. Archived from the original on 2010-02-19. Retrieved 2010-06-05. ^ "City Administration". City of Liberal. Archived from the original on 2010-02-19. Retrieved 2010-06-05. ^ "USD 480 Schools". Unified School District 480. Retrieved 2010-05-26. ^ "City of Liberal, Education, Schools, Colleges". City of Liberal. 2008. Archived from the original on 2010-04-09. Retrieved 2010-05-26. ^ "General Highway Map - Seward County, Kansas" (PDF). Kansas Department of Transportation. 2009-01-01. Retrieved 2011-06-02. ^ "KLBL - Liberal Mid-America Regional Airport". AirNav.com. Retrieved 2011-06-02. ^ "PenAir Midwest Destinations". Retrieved 2017-02-16. ^ "UPRR Common Line Names" (PDF). Union Pacific Railroad. Retrieved 2010-06-05. ^ "Record Details - Leader & Times". Kansas Press Association. Retrieved 2013-07-14. ^ "Liberal Leader & Times". Mondo Times. Retrieved 2013-07-14. ^ "Record Details - El Lider". Kansas Press Association. Retrieved 2013-07-14. ^ "Record Details - Crusader". Kansas Press Association. Retrieved 2013-07-14. ^ "Record Details - Liberal Light". Kansas Press Association. Retrieved 2013-07-14. ^ "AMQ AM Radio Database Query". Federal Communications Commission. Archived from the original on August 25, 2009. Retrieved 2013-07-14. ^ "FMQ FM Radio Database Query". Federal Communications Commission. Archived from the original on August 25, 2009. Retrieved 2009-09-09. ^ "TV Market Maps - Kansas". EchoStar Knowledge Base. Archived from the original on 2011-07-26. Retrieved 2013-07-14. ^ "Digital TV Market Listings". RabbitEars.info. Retrieved 2013-07-14. ^ "Wayne D. Angell". U.S. Trade Deficit Review Commission. Retrieved 2011-06-02. ^ "Chris Brown Named Head Coach of Fort Hays State Football". Fort Hays State University. 2010-12-10. Retrieved 2011-06-02. ^ "LAMAR CHAPMAN". profootballarchives.com. Archived from the original on June 27, 2015. Retrieved November 25, 2014. ^ "Girl Jockey: Wantha Davis - Timeline". Retrieved 2011-06-02. ^ "Kasey Hayes". Professional Bull Riders. Archived from the original on 2011-06-25. Retrieved 2011-06-02. ^ "Kristin Key". Last Comic Standing. NBC. Archived from the original on 2013-06-01. Retrieved 2011-06-02. ^ "Shalee Lehning". WNBA Draft 2009 - Prospect Search. Women's National Basketball Association. Archived from the original on 2012-02-04. Retrieved 2011-06-02. ^ "Martin Lewis". Basketball-Reference.com. Retrieved 2011-06-02. ^ "Laura Gibbs Maczka". Dallas Morning News. Retrieved 2013-05-12. ^ Fender, Jessica (2010-09-29). "Police files show Maes met with Kansas agents". The Denver Post. Archived from the original on 2011-06-29. Retrieved 2011-06-02. ^ "Kelli McCarty". IMDb. Retrieved 2011-08-11. ^ Leggett, Steve. "Jerrod Niemann - Biography". AllMusic. Retrieved 2011-06-02. ^ "Melvin Sanders". Basketball-Reference.com. Retrieved 2011-06-02. ^ "William Stafford". University of Nebraska-Lincoln - Center for Great Plains Studies. Retrieved 2011-06-02. ^ "Doug Terry". Scottish Claymores. Archived from the original on 2007-08-11. Retrieved 2011-06-02. ^ "Dallas Trahern". Baseball-Reference.com. Retrieved 2011-06-02. ^ "Jerame Tuman". National Football League. Retrieved 2011-06-02. ^ "General Larry D. Welch". United States Air Force. Archived from the original on 2010-04-14. Retrieved 2011-06-02. Wikimedia Commons has media related to Liberal, Kansas. Wikivoyage has a travel guide for Liberal, Kansas. This page was last edited on 4 April 2019, at 00:47 (UTC).